The authors criticize a misunderstanding of interference practice contained in the board’s opinion in Mylan Pharmaceuticals Inc. v. St. Regis Mohawk Tribe. Charles L. Gholz is senior counsel in Oblon, McClelland, Maier & Neustadt LLP in Alexandria, Va. He can be reached at 703-412-6485 or cgholz@oblon.com. Christopher Ricciuti is an associate in Oblon, McClelland, Maier & Neustadt LLP in Alexandria, Va. He can be reached at 703-412-3527 or cricciuti@oblon.com. The views expressed herein are those of the authors and are not necessarily shared by their employer or its clients. Our analysis herein is specific to the applicability of tribal immunity in inter partes review proceedings, in which the Board assesses the patentable scope of previously granted patent claims, and does not address contested interference proceedings, which necessarily involve determining the respective rights of adverse parties concerning priority of inventorship. Cf. Vas-Cath, Inc. v. Curators of Univ. of Mo., 473 F.3d 1376, 1382 (Fed. Cir. 2007). However, the panel’s purported distinction between inter partes reviews (IPRs) and interferences is based on a misunderstanding of interference practice. As is well known (both by the remaining members of the interference bar and the remaining APJs who used to be members of the interference section of the board), the majority of “contested interference proceedings” terminate at the end of the first phase (i.e., what used to be called “the motions period”) based on the panels’ assessments of “the patentable scope” of the parties’ claims. That is, the majority of interferences (whether or not “contested” in the sense that both or all parties to the interferences as declared litigate to the bitter end) terminate at the end of the first phase in a judgment that the claims of one, both, or all parties are unpatentable over prior art, for lack of 35 U.S.C. § 112, ¶ 1, support, or on any other ground available to a party defending a charge of patent infringement in a federal district court. 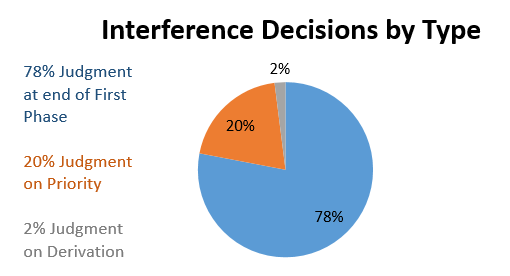 Accordingly, the majority of interferences do not involve either: (1) the determination of conception dates, actual reduction to practice dates, or diligence dates; or (2) the determination of whether or not one party derived the claimed subject matter from the other — which are the two types of issues traditionally determined in the second phase of interferences. The claims held unpatentable in interferences are, of course, not always in “previously granted patents.” However, modern interference practice before the board (in contrast to the rare patent-patent interferences under 35 U.S.C. § 291, which are conducted in federal district courts) makes no distinction between interferences involving only applications and interferences involving at least one application and at least one patent. Accordingly, we don’t think that the members of the panel in Mylan were trying to draw a distinction between application-application interferences before the board and application-patent interferences before the board. The Mylan panel’s misunderstanding of interferences as being “necessarily” priority proceedings is, unfortunately, common. The senior author of this article levied the same criticism against an academic article in Gholz and Pereira, Straddle Interferences, 95 PTCJ 593 (March 16, 2018). Moreover, we are aware of no published statistical support for our contention that the majority of interferences before the board that are litigated to judgment are terminated by judgments based on traditional patentability issues (as opposed to being terminated based on determinations of entitlement to invention dates prior to filing dates). 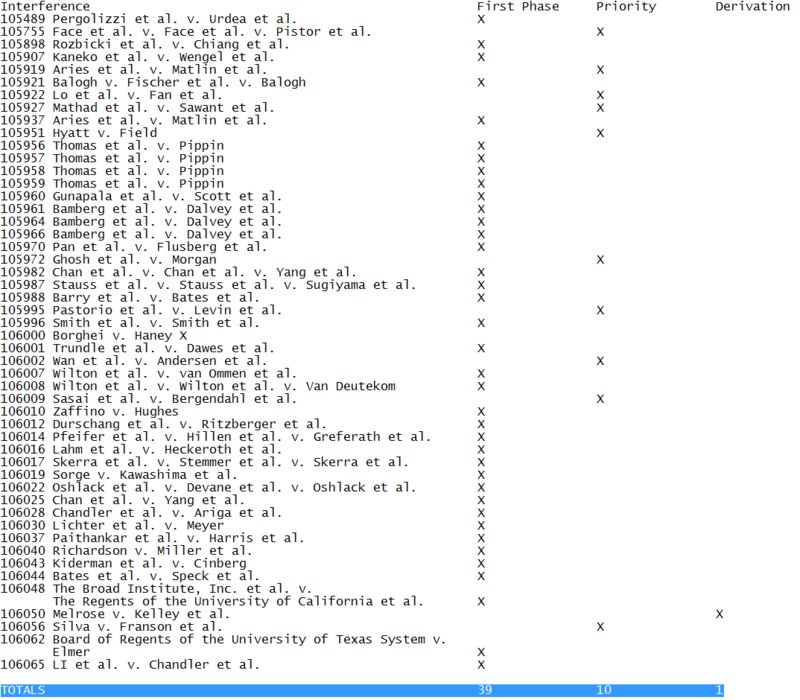 As shown below and in the table, nearly 80 percent of interferences litigated to judgment end at the first phase of the proceeding without an actual priority determination. And, although the exact percentage of interferences litigated to judgment without determinations of either pre-filing invention dates or derivation no doubt varies from year to year, we believe that the general proposition that they have long been in the majority is unassailable. Congress has enacted a generally applicable statute providing that any patent (regardless of ownership) is “subject to the conditions and requirements of [the Patent Act].” 35 U.S.C. § 101; see also 35 U.S.C. § 261 (“ Subject to the provisions of this title, patents shall have the attributes of personal property.”) (emphasis added [by the panel]). Congress has further determined that those requirements include inter partes review proceedings. See 35 U.S.C. §§ 311-319. In this regard, Congress has given the Patent and Trademark Office statutory authorization both to grant a patent limited in scope to patentable claims and to reconsider the patentability of those claims via inter partes review. MCM Portfolio LLC v. Hewlett-Packard Co., 812 F.3d 1284, 1289 (Fed. Cir. 2015) (noting that Congress granted the PTO “the authority to correct or cancel an issued patent” by creating inter partes review). Moreover, these proceedings do not merely serve as a forum for the parties to resolve private disputes that only affect themselves. Rather, the reconsideration of patentability of issued patent claims serves the “important public purpose” of “correct[ing] that agency’s own errors in issuing patents in the first place” Id. at 1290. Indeed, as the Supreme Court has explained, a “basic purpose” of inter partes review is “to reexamine an earlier agency decision,” i.e., take “a second look at an earlier administrative grant of a patent,” and thereby “help[ ] protect the public’s ‘paramount interest in seeing that patent monopolies … are kept within their legitimate scope.’” Cuozzo Speed Techs., LLC v. Lee, 136 S. Ct. 2131, 2144 (2016) (internal citations omitted [by the panel]). Obviously, rigorously parallel statements could be made about what Congress did in setting up the interference system insofar as the interference system is used to determine traditional patentability issues (as opposed to priority and derivation issues). This is not to say that the authors of this article have reached the conclusion that tribal immunity also does not apply to interference proceedings. If pressed by the exigencies of a given interference proceeding, we might be able to come up with an argument that tribal immunity should apply to interference proceedings. All we are saying is that no such argument occurs to us at the moment. Moreover, we applaud the panel’s leaving of this issue for another day. It is always prudent for a judicial body to decide only what the litigation before it requires it to decide. Because there are still a number of APJs who are extremely knowledgeable concerning interference law and practice, if the members of the Mylan panel felt compelled to say something about interference practice, why didn’t they discuss their draft with one of them before hitting the send button? Doing so might have led to a substantial revision of Footnote 5.